The highest body that meets every two years to elect the Board of Directors of the Association and passes upon organizational matters. The governing body that passes upon policy matters. It is composed of not more than 30 duly elected voting members of the Association that elect from among them the Chairman, three Vice-Chairman and the Treasurer. The Secretary General is an ex-officio member of the Board. The Association is managed by a Secretary General assisted by service unit heads that constitute the Secretariat. The Secretariat has a fully functioning business center and full-time professional staff to carry out its programs, engagements, and assignments. Its main service units are: membership, projects, training & credentialing, information, and finance & administration. The Association’s Asia-Pacific Institute for Development Finance conducts regular training courses and manages the credentialing program of the Association. The ADFIAP Board of Directors sets the future of the Association. It sets its vision and mission and operational goals. a)	The Association shall be managed by a Board of Directors consisting of not more than thirty (30) Ordinary Members. The Board of Directors shall appoint a Chairman, not more than three Vice-Chairmen, and a Treasurer. b)	The Board of Directors shall appoint a maximum of three (3) Advisers from the non-voting members, i.e. Special, Cooperating, and Associate, to sit in the Board of Directors as ex-officio members. c)	The Board Members are personally committed to the mission of the Association, willing to volunteer sufficient time and resources to help achieve its mission and to fulfill their fiduciary responsibilities. d)	The Secretary General shall serve as a voting member of the Board of Directors. e)	To allow for significant deliberation and diversity, the Board is made up of elected member-institutions represented by their Chief Executive Officers and/ or Chairmen, whoever is designated by the member-institution. f)	The Association’s Constitution determines the term limits of the Directors. g)	The Board Members do not receive compensation for their service. h)	The Board nomination process is announced to the Association’s general membership so that interested members can nominate themselves or others. successive years before retiring and being eligible for reelection. staff of the Secretariat, subject to the overriding authority of the General Assembly. a)	The Board meets regularly to review its strategic direction, to define specific goals and objectives related to the mission, and evaluates the success of the Association’s services. b)	The Board approves the policies of the Association. c)	The Board annually approves the Association’s budget and assess the Association’s financial performance in relation to the budget at least twice a year. d)	The Board is responsible for the financial health of the Association and its fund development activities, i.e., setting members fees, getting sponsors for its programs, and other fundraising activities to support its programs and services. e)	The Board promulgates the hiring policies for the Secretariat staff and reviews the performance of the employees. f)	The Board sets and annually reviews the overall compensation structure, and ensure that commensurate compensation is paid to all its employees and establishes policies on employee medical, retirement, vacation, and sick leave, as appropriate. g)	The Board approves written policies and procedures governing the work and actions of the Association’s employees. h)	The Board ensures that there is an internal review of the Association’s compliance with known existing legal, regulatory, and financial reporting requirements. i)	The Board periodically assesses the need for security of its premises and staff such as insurance coverage in light of the nature and extent of the Association’s activities and its financial capacity. a)	The Board designates their own working Committees, its Chairman and members who are responsible for their own operations according to the terms of reference established for each of the committees. b)	The Board and its Committees will meet as frequently as needed to adequately conduct the business of the Association. At a minimum, the Board should meet physically at least two times a year with a quorum present but may consult each other at any time by e-mail or other means of communication. c)	Written meeting minutes should reflect the actions of the Board, including reports of the Board committees. The Secretary General should permanently retain the minutes, distribute them to Board and committee members, and make them available for the member’s review. The Board will establish conflict of interest policies regarding Board, staff, contractors, and Association partners or allies and adhere to these policies in all dealings. The policies will include an obligation of each Board Member to disclose all material facts and relationships and refrain from voting on any matter when there is a conflict of interest. a)	Serves as the chief spokesman of the Association on matters relating to the vision and mission of the Association and for important pronouncements that are likely to affect development financing in the region. b)	Is the official representative of the Association’ meetings of regional and international bodies. c)	Provides leadership to the Board of Directors, who sets policy and to whom the Secretary General is accountable. d)	Chairs meetings of the Board after developing the agenda with the Secretary General. e)	Appoints the chairpersons of committees, in consultation with other Board members. f)	Guides Board action with respect to organizational priorities and governance concerns. g)	Reviews with the Secretary General any issues of concern to the Board. h)	Monitors financial planning and financial reports. i)	Plays a leading role in fund development strategies and fundraising activities. 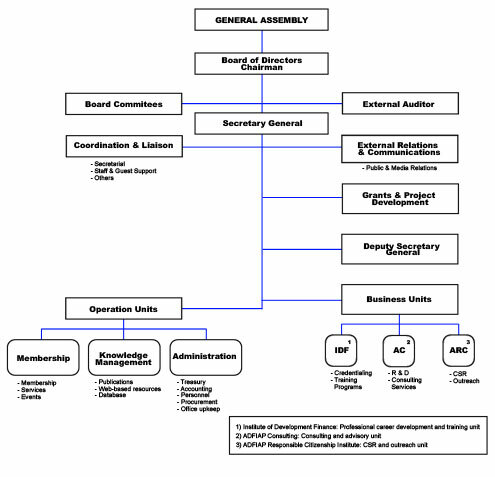 j)	Evaluates the performance of the organization and the Board. k)	Performs other responsibilities assigned by the Board. b)	Reports to the Board’s Chair. d)	Participates closely with the Chair to develop and implement officer transition plans. e)	Performs other responsibilities as assigned by the Board. a)	Regularly attends board meetings and related important meetings. d)	Gets to know other committee members and builds a collegial working relationship that contributes to consensus. e)	Is an active participant in the Board meetings and annual planning events. f)	Participates in fundraising for the organization. a)	Manages the finances of the organization. c)	Endorses the annual budget to the Board for approval. d)	Responsible for the regular review of financial policies and procedures. a)	Reports to the Board’s Chair. b)	Reports to the Board the decisions/recommendations of the Committee. meetings, and ensures distribution of meeting minutes. This position is part of the job description of the Secretary General who is also the Chief Executive of the Association. a)	Maintains records of the Board and ensures effective management of the Association’s records. b)	Manages minutes of Board meetings. c)	Ensures minutes are distributed to members shortly after each meeting. d)	Is the official custodian of the legal documents (articles, by-laws, letters, etc.) and guides the Board during meetings, as required. From September 1977 to 1986, the Private Development Corporation of the Philippines (PDCP) was the Secretariat of ADFIAP. After 1986, it became an autonomous Secretariat and moved to its own permanent headquarters, which is at the Skyland Plaza in Makati City, Philippines in 1991. The Secretariat is headed by a Secretary General who is also an ex-officio member of the Board of Directors. He is assisted by a Deputy Secretary General. The Secretariat has the following major units. Membership retention and recruitment, fellowship services such as the Annual Meetings, the Country Host Program, the ADFIAP Awards Program, the Board Meetings, and the database management that consists participants lists, international partners, consultants and resource persons. – The Institute of Development Finance responsible for the development of training curriculum courses, certification and credentialing programs, computer-based training and special courses. – The Strategic Center for Development Finance responsible for advisory and consultancy services, information technology projects, research and publications and other special projects. – The Advocacy Center responsible for communications, media and public relations. Project development and grant proposal preparation as well as research on grant-giving organizations worldwide. •	The Finance & Administration unit which is responsible for: Treasury and accounting, personnel, bank relations and resource management. •	The Secretary General shall be appointed by the Board of Directors upon such terms and conditions as they may determine. The Secretary General shall concurrently be the Secretary of the Board and an ex-officio member of the Board. •	The Secretary General shall, with the approval of the Board of Directors, appoint such persons as staff of the General Secretariat upon terms and conditions approved by the Board of Directors. –	implement all decisions and measures of the Association, whether decided by the General Assembly or Board of Directors, within the provision of the Constitution, or rules, by-laws and directives as amended from time to time. –	manage the finances of the Association under the supervision of the Board of Directors. DEVELOPMENT BANK OF JAPAN, INC.